See below for complete list of Keeshond characteristics! 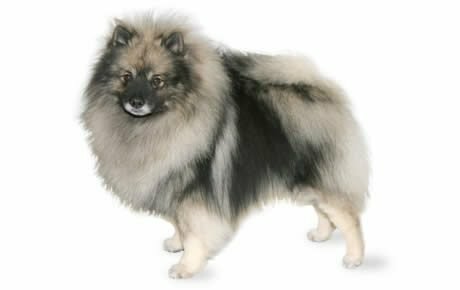 The Keeshond (pronounced KAYZ-hawnd) is a medium-sized dog with an impressive gray, black, and cream coat and a massive, plumed tail. He was known for years as the "Dutch Barge Dog" because of his role as companion and guardian on barges and small boats on Holland's many canals and rivers. While the Keeshond will issue a stern bark when someone approaches his property, he's such a love that he'll readily accept anyone his owner brings into the household. In truth, he isn't a very effective guard dog. The Keeshond is a fan of cool weather. He likes spending time outside when the weather is crisp. However, he isn't a backyard dog; he's too people-oriented for that. He needs to live inside with his family and participate in all their activities. Besides being an excellent family pet, today's Keeshond can strut his stuff in the conformation ring, obedience ring, and rally competition. He's also sure-footed, which makes him a great agility competitor. The Keeshond is never reluctant to issue a warning bark to alert his family to strangers. His propensity to bark can be a problem if he's left alone too much and becomes bored. The best way to make a Keeshond miserable is to keep him separated from his family. He was bred to be a companion, and he needs to be part of family life. If you don't want a dog joining in family barbeques, card games, or movie time, consider a more independent breed. Keeping the Keeshond coat in good condition isn't terribly difficult, but the breed does shed like crazy once or twice or year. Luckily, frequent bathing isn't usually needed — the Keeshond scores low on doggie odor. The Keeshond is a close cousin to the Samoyed, Chow, Norwegian Elkhound, Finnish Spitz, and Pomeranian. In the 17th and 18th centuries, the Keeshond was a companion and watchdog on small vessels called rijnaken on the Rhine River. The Keeshond became the best-loved dog of Holland during a time of political unrest. Holland was divided into two factions: the prinsgezinden, or followers of the Prince of Orange, and the patriotten, or patriots. The patriots were led by one Cornelius de Gyselaer, who had a spitz-type dog named Kees as his constant companion. De Gyselaer's followers were derisively referred to as Keezen by the opposing Orange party. The Keeshond became a symbol of the rebel party, and the breed became popular among ordinary people. In time, the followers of the Prince of Orange overthrew the rebel party and the Keeshond fell into disfavor as the representative of a lost cause; many dogs were destroyed. Some survived on Dutch farms and on barges around Amsterdam. The breed was rediscovered in 1905 by a Miss Hamilton-Fletcher (later to become Mrs. Wingfield-Digby). She convinced her parents to take home two puppies. These dogs were taken to England and became the foundation stock for the breed's introduction outside of Holland. Mrs. Wingfield-Digby and Mrs. Alice Gatacre aroused interest in the breed in England and, in 1926, the English breed club was formed. The decline of the Keeshond in Holland continued until 1920, when Baroness van Hardenbroek became interested in the breed. The Baroness found that the dogs were still kept by riverboat captains, farmers, and working people. She began breeding Keeshonds and spread their story throughout Europe. Within 10 years, the Dutch Keeshond Club was formed. The first American litter of Keeshonds was bred in 1929 by Carl Hinderer. The first Keeshond was registered with the American Kennel Club in 1930 in the Non-Sporting Group, and the Keeshond Club of America was formed in 1935. Males stand 18 inches tall and weigh approximately 45 pounds. Females stand 17 inches tall and weigh approximately 35 pounds. The Keeshond was bred more to be a companion than a watchdog. He's not a hunter, nor does he have an innate desire for any special job. He is, first and foremost, a devoted friend. He's also intelligent and highly trainable. He's so smart, in fact, that he can be a little mischievous. Expect the unexpected with these fellows. Despite this, the breed easily learns proper canine manners and can do well in the obedience ring. A Keeshond is a lively, alert dog, full of personality. When he's excited or happy, he likes to share his joy with everyone, often spinning in circles. His outgoing personality, as well as his love of adults and children alike, endears him to all. As with every dog, the Keeshond needs early socialization — exposure to many different people, sights, sounds, and experiences. Socialization helps ensure that your Keeshond puppy grows up to be a well-rounded dog. Keeshonds are generally healthy, but like all breeds, they're prone to certain health conditions. Not all Keeshonds will get any or all of these diseases, but it's important to be aware of them if you're considering this breed. Addison's Disease: Also known as hypoadrenocorticism, this is an extremely serious condition caused by an insufficient production of adrenal hormones. Most affected dogs have a poor appetite, vomit, and are lethargic. Because these signs are vague and can be mistaken for other conditions, it's easy to misdiagnose this disease until it reaches more advanced stages. More severe signs occur when a dog is stressed or when potassium levels get high enough to interfere with heart function, causing severe shock and death. If Addison's is suspected, your vet may perform a series of tests to confirm the diagnosis. Diabetes Mellitus: This is a disorder in which the body cannot regulate blood sugar levels. Glucose (sugar) is needed by the cells of the body to burn for energy; insulin is the key that lets the glucose into the cell. Without insulin, the glucose cannot enter the cell, so the cells are "hungry" even though there are high levels of glucose circulating in the blood. A diabetic dog will eat more food to try and compensate, but he'll lose weight because food is not being used efficiently. Symptoms of diabetes are excessive urination and thirst, increased appetite, and weight loss. Diabetes can be controlled by diet and the administration of insulin. Allergies: Allergies are a common ailment in dogs, and the Keeshond is no exception. There are three main types of allergies: food allergies, which are treated by eliminating certain foods from the dog's diet; contact allergies, which are caused by a reaction to a topical substance such as bedding, flea powders, dog shampoos, and other chemicals; and inhalant allergies, which are caused by airborne allergens such as pollen, dust, and mildew. Treatment varies according to the cause and may include dietary restrictions, medications, and environmental changes. In Keeshonds, you should expect to see health clearances from the Orthopedic Foundation for Animals (OFA) for hip dysplasia (with a score of fair or better), elbow dysplasia, hypothyroidism, and von Willebrand's disease; from Auburn University for thrombopathia; and from the Canine Eye Registry Foundation (CERF) certifying that eyes are normal. You can confirm health clearances by checking the OFA web site (offa.org). Having been bred first for life on a barge and later as a companion dog, the Keeshond has learned how to be happy in a relatively small space. He can live cheerfully in an apartment, a home with a large yard, or on a boat. More important than space is the Keeshond's need to live in the house with his family. Because he's a companion breed, it's essential that he be allowed to share as many aspects of his owners' lives as possible. If left unattended in the yard for hours on end, with little or no contact with his family, he'll become bored and his natural propensity to bark will intensify. He can become a nuisance barker if allowed. If you don't plan on spending quality family time with your Keeshond in the house on a daily basis, you should consider a different breed. While every dog benefits from exercise, the Keeshond does not require a great deal of it. 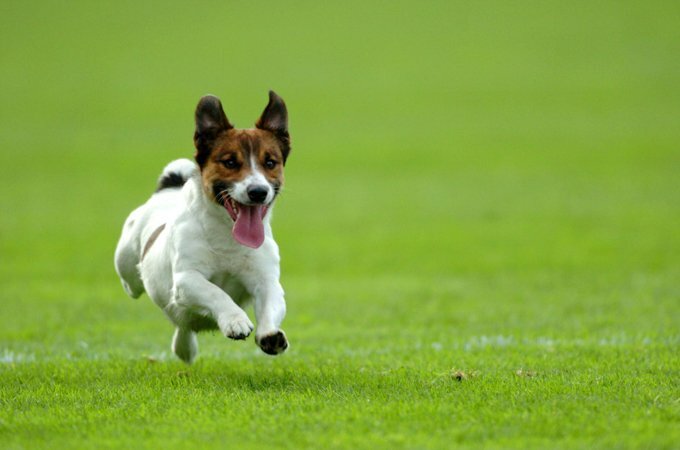 He isn't generally considered to be the breed of choice for long-distance runners, for example. For your own health as well his, though, plan on at least one vigorous daily walk. The Keeshond is not fond of hot climates; he's happiest and most comfortable in cool weather. On hot days, keep him inside in an air-conditioned house or near fans. Some Keeshonds will also enjoy lounging in a small children's wading pool filled with cool water. Keep your Keeshond in good shape by measuring his food and feeding him twice a day rather than leaving food out all the time. If you're unsure whether he's overweight, give him the eye test and the hands-on test. For more on feeding your Keeshond, see our guidelines for buying the right food, feeding your puppy, and feeding your adult dog. The Keeshond look is fabulous, with his thick, double top coat, woolly undercoat, and a longer outer (or guard) coat. His mane is more profuse in males than in females. His hindquarters have "trousers," longer hair down to the hocks. His tail is like a plume set on a lady's hat. The Keeshond color is a combination of cream, black, and gray. He has unique facial markings that seem to form spectacles, with a delicate, dark line running from the outer corner of each eye toward the ear. Surprisingly, the Keeshond's full coat is relatively easy to maintain. Matting isn't a severe problem, as long as you brush him at least twice a week. He does shed profusely twice a year, when he "blows" or sheds his entire undercoat all at once. This shedding period can be intense and can last for three weeks. Keeshonds are relatively clean dogs; their doggie odor is minimal. Bathing is necessary about every three months or so (more often, of course, if he rolls in something smelly or plays in mud). Given the breed's heavy coat and intolerance to heat, you might think it's wise to shave down the coat in the summer. Not so — the coat actually insulates, keeping the Keeshond cool and protecting him from sunburn. Brush, don't shave. Trim his nails once a month, and his ears checked once a week for dirt, redness, or a bad odor that can indicate an infection. Then wipe them out weekly with a cotton ball dampened with gentle, pH-balanced ear cleaner to prevent problems. Brush your Keeshond's teeth at least two or three times a week to remove tartar buildup and the bacteria that lurk inside it. Daily brushing is even better if you want to prevent gum disease and bad breath. Begin accustoming your Keeshond to being brushed and examined when he's a puppy. Handle his paws frequently — dogs are touchy about their feet — and look inside his mouth. Make grooming a positive experience filled with praise and rewards, and you'll lay the groundwork for easy veterinary exams and other handling when he's an adult. The Keeshond is a great pet for families with children. He's a playful, good-natured companion for kids of all ages. And as long as he is well socialized and well trained, the Keeshond gets along well with other dogs and pets. Consider adopting a Keeshond from a rescue group before going to a breeder.